1. 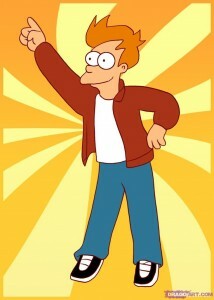 Fry from ‘Futurama’ – The loveable Red-headed slacker. 2. ‘Strawberry Shortcake’ – She couldn’t get enough of the red stuff! 3. Lion-O from ‘Thundercats’ – Who can deny this red-headed hunky hero? 4. Dogtanian from ‘Dogtanian and the Three Muskehounds’ – Fun starts when he dons his red cape of justice. 5. Optimus Prime from ‘Transformers’ – Leader of the Autobots and saviour of Earth! Even a robot alien knows that Red is the coolest colour in the galaxy. 6. Blossom from ‘The Powerpuff Girls’ – Made from sugar and spice and all things nice, with a little bit of Chemical X! She knows that Red is the way to go for recognition! 7. ‘She-Ra’ – Better than ‘He-Man’ because she has fashion sense too! It’s all about that Red cape of hers! 8. Papa Smurf from ‘The Smurfs’ – This wise old Smurf knows that Red is never out of fashion. 9. ‘The Care Bears’ – Who can remember all their names? But we all remember the red one with the heart! 10. Alvin from ‘Alvin and the Chipmunks’ – No, not the CGI movie, we’re talking about the classic cartoon from the days of old.